67% of users said they would purchase this again. 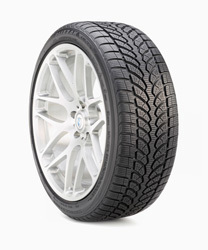 Great winter tires, especially for a front-wheel drive vehicle. Our winter was not so bad this year, but during the few major snowstorms of the season, the tires made the drive to work (before the plows were able to get out) manageable. Dunn Tire's Lowest Price Guarantee insures that on identical products our "Out The Door" pricing will beat any competitor's price for the same tire and services. Please choose a store to see available pricing. At Dunn Tire, we are your Tire Team. Our Tire Know How is the best in the business, and our service is 2nd to none. Our prices are also the best in the business. We shop our competition, and we know their prices. We want you to be so confident in our prices that we will protect you for 90 days against competitors' price changes. If a competitor lowers their price on the same tires you bought from us, you are protected as a Dunn Tire customer. Our Price Protection Policy is: If you find a lower advertised price on identical tires, with the same services, within 90 days of your purchase from Dunn Tire, we will refund you 200% of the difference. That is our pledge to you. And that is buying with confidence. 12. 200% Price Protection Guarantee. View all 12 items included in our Out-the-Door Installation Package.